Wake-up early, put on some comfy boots, take a beach towel, swim suit and drive to the very heart of Costa Brava! Please take a walk along one of the most emblematic coastal paths. The route is conveniently sign-posted so you can’t get lost! Visit the Three pines next to Hotel la Torre in Calella and gather strength to start the walk along the coast to Cap Roig. Cross Canadell promenade and view the colonial houses. You will then reach the remarkable pink house patio, les voltes at Port Bo beach where the well-known Havaneres show takes place; stroll to Port Pelegrí beach. There you can enjoy diving and discover our seabed. Don’t miss Sant Roc beach and, after climbing the stairs on the right, take the path that surrounds the hotel and that will take you to Golfet beach, one of the most treasured spots of the municipality. 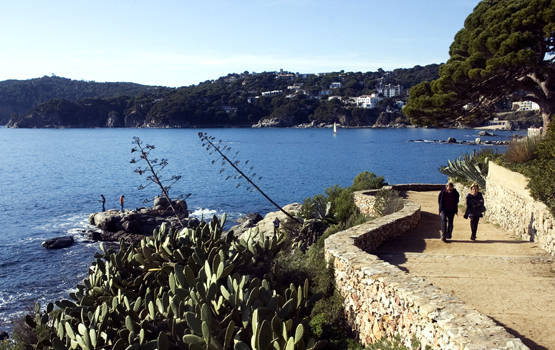 Walk a few meters back and take the stairs leading to the road to the Cap Roig botanical gardens, considered one of the Mediterranean’s most important venues, with more than a thousand botanical species from all around the world as well as sculptures by national and international artists. After visiting the castle and learning about the story of its origin, find the way to the privileged Woevodsky’s swim area, known as the Russian’s bath. If you can’t get enough, take the GR92 walk to the south and you’ll find the naturist coves of el Crit and cala Estreta, less known due to their difficult access but spectacularly unspoilt and beautiful. Alongside is Castell beach, cala s’Alguer and la Fosca before arriving to the heart of Palamós township. If you get there, you are a winner! Return on the same path to make sure that you have the best pictures of the coastal scene and have a rest at any of Calella’s terraces. With renewed energies, return to your starting point and follow the route in the other direction to Llafranc. Once there, you may feel like trying a typical arròs negre (black rice) served with an excellent D.O. Empordà wine. As a light after-lunch tour before driving back, pass by Santa Rosa church and the Roman wine press, right next to it. Then drive up to the lighthouse to get the best views and visit the Sant Sebastià de la Guarda Monumental Site. To complete the route, don’t miss Tamariu : a ten-minute drive or a little over an hour’s walk through the lonely cala Pedrosa beach and enjoy a quiet evening walking along the bay to the Liris cove with its centenary hut to the south and stony Aigua Dolça cove to the north.